Travel back in time to a 1950s Americain Full Moon Romance from Thunderkick. However, there’s a twist! The two young lovers we encounter at the drive-in movie theatre are actually werewolves! The game itself is played over a standard five by three grid and prizes are awarded for matching symbols along one of the 15 win lines. There are also some great bonus features to keep the action fresh. We’ll go into greater detail about these and everything else this video slot machine has to offer below though. Let’s start! Great theme. There’s a strong feeling of a classic 1980s teen romance movie set in 1950s America – think drive in movie theatres and captains of the football team – only crossed with werewolves! The music, artwork, and imagery all support this too. Interesting bonus features. Thunderkick aren’t usually well-known for their gameplay additions. However, Full Moon Romance is an exception to this trend. Very low main game prizes. When you’ve played slot machines that offer huge five-figure prizes for matching five-of-a-kinds, the 15x the total bet seems a little on the stingy side! Players aren’t given many options to distribute their bets across the grid. This is a minor quibble though. Guy = 15x the total bet. Girl = 15x the total bet. Werewolves = 15x the total bet. Dog bone = 7x the total bet. Bouquet of Flower = 6x the total bet. The Sweetheart symbol is a 3×1 symbol. There are two different kinds of Sweetheart symbols. 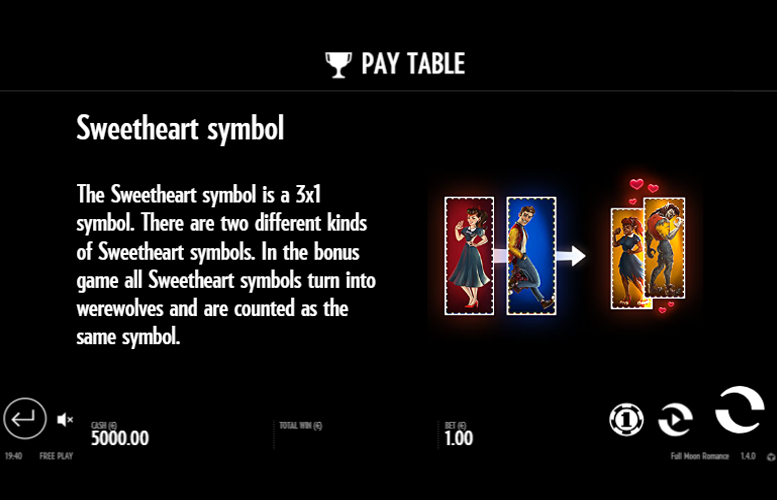 In the bonus game, all Sweetheart symbols turn into werewolves and are counted as the same symbol. 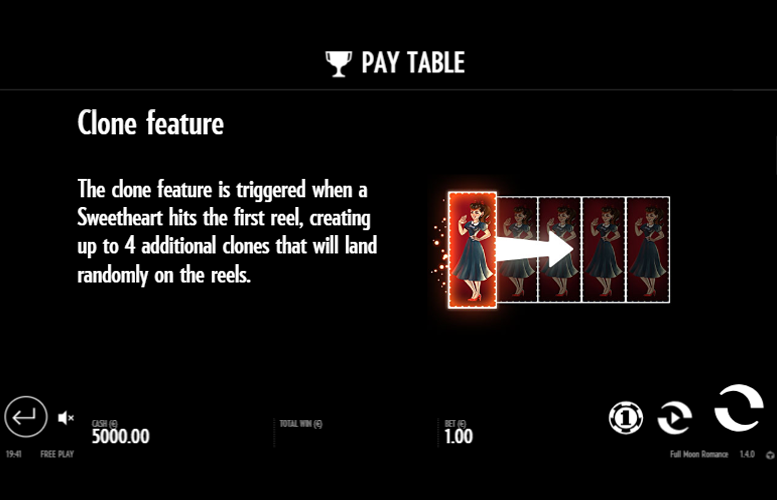 The clone feature is triggered when a Sweetheart hits the first reel. This creates up to four addition clones that will land randomly on the reels. Three Full Moon “Scatter” Symbols = 10 Free Spins. Four Full Moon “Scatter” Symbols = 15 Free Spins. 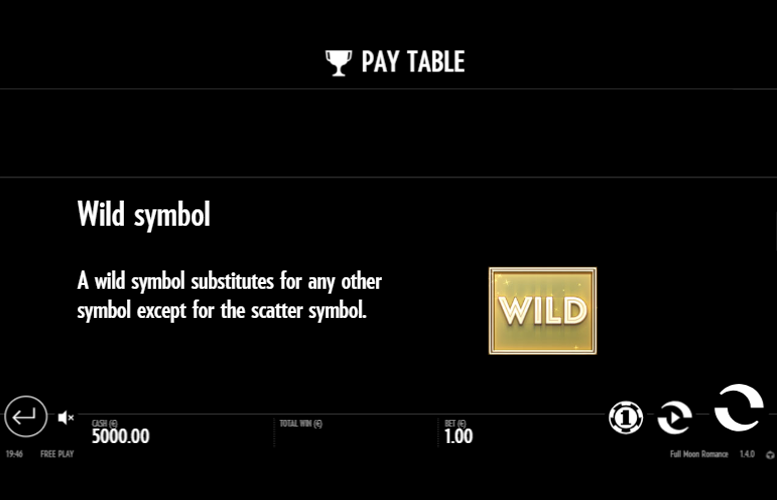 Five Full Moon “Scatter” Symbols = 20 Free Spins. Ace = 5x the total bet. King = 4x the total bet. Queen = 3.5x the total bet. Jack = 3x the total bet. 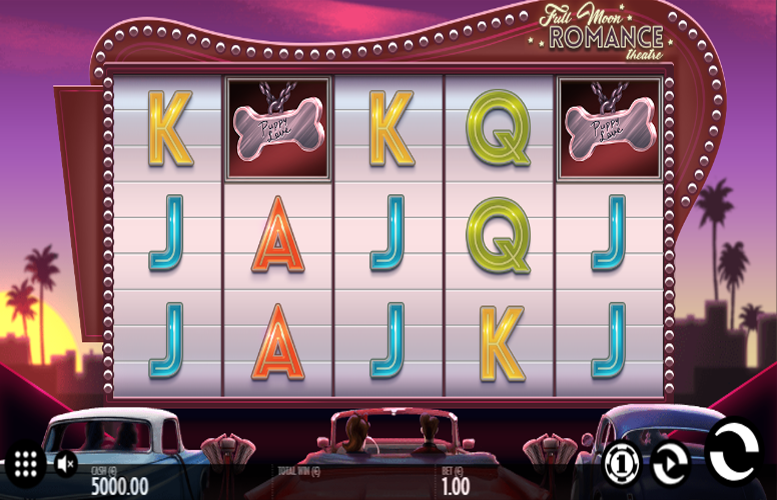 As with other Thunderkick slot machines, players aren’t given massive scope to vary their bet sizes or distributions on the Full Moon Romance slot machine. 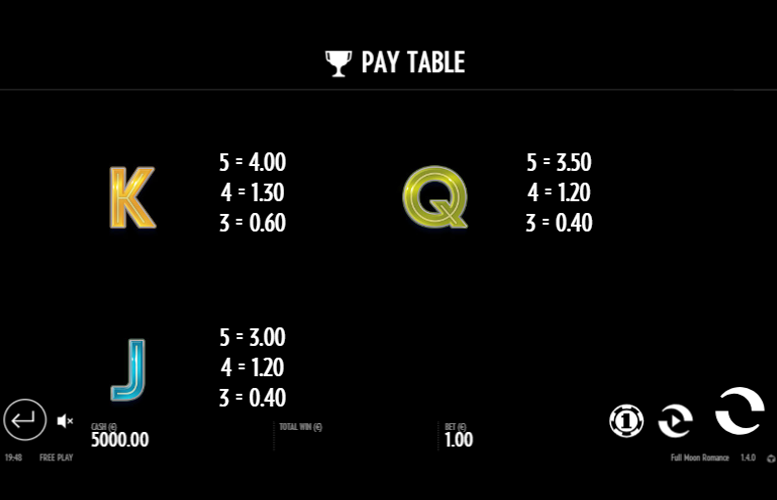 On the titles of many other developers, options are provided to adjust the number of win lines played on every spin, as well as the number of coins bet on each one. This is not the case here, however. Instead, players are presented with a list of 12 total bet amounts. These range from a low of just 10p up to a maximum betting limit of £100. Whereas some of the highest rollers around will likely find this upper constriction too low, we think most players will be more than happy with the maximum bet on Full Moon Romance. The Full Moon Romance slot machine by Thunderkick is a decent title. We particularly enjoyed the game’s theme of 1950s Americana mixed with werewolves. The surf rock soundtrack, bubble gum card-style artwork, and drive-in movie theatre setting all complement each other to create a slot with a strong feel all its own. The slot isn’t just solid on the imagery front, however. It also packs in some interesting special features. Along with a generous free spin mode, there is also the addition of symbols that can clone one another. These combined can create some really juicy winning combinations! 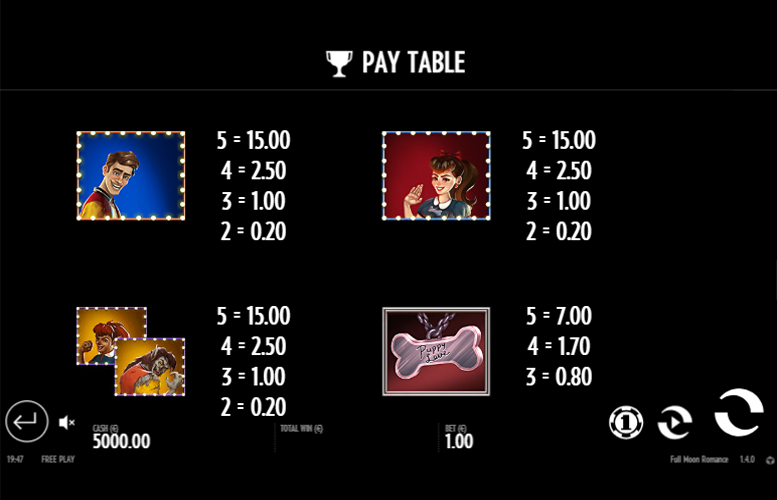 Unfortunately, the slot is let down slightly by the lack of sizeable main game prizes. If you were hoping to spin in huge wins by just matching symbols along a win line, you’re in the wrong place! This game has a rating of 4 / 5 with 704 total reviews by the users.